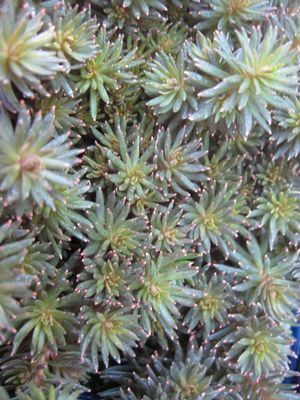 The hot topic of this needle-like textured creeping Sedum is the amazing coppery-red fall and winter color that will grab attention on a dreary winter day. Silver foliage and star-like yellow flowers in summer reach an overall height of 6”. Place in the rock garden, container or dish garden and provide well drained soil. Somewhat tender, however, this Sedum is not afraid of a little shade.